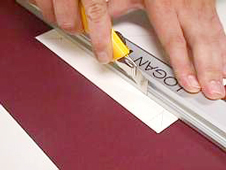 Before you cut a mat you should ensure that your mat board has been squared up.The first stage is squaring the mat.There are numerous ways of squaring your mat board but I will show you a simple method using a straight edge, tape measure or ruler and a utilaity knife. Draw two diagonal lines on the back surface of your mat board.I doesn’t matter whether or not they disect the corners….as long as there are two straight lines that cross somewhere in the middle of the board. Measure out to a point from where the lines cross in the centre of the board. The measurement is irrelevent but you should try to measure as far as possible and pick a whole number. You need to do this from the centre along each diagonal…marking the same measurement each time. Join up the marks with a straight line. Do this for the perimeter of the board and you should have a squared up mat ready to measure out to the correct size. 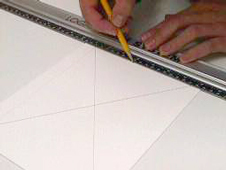 Trim the board to size along the lines drawn using a utility knife. Make sure that you put your straight edge on the side of the board you wish to keep…that way if you slip it will be into the waste. Remember that the utility knife cuts along its flat surface not the tip so you should have a shallow angle between the knife and the board. That way you are presenting the maximum cutting surface onto the board. Note that it is easiest to cut the board in several passes. Scoring first and then gradually cutting through with each successive cut. You can now draw up your window size on the back of the mat by measuring in from the edge of the board. There are many tools that will allow you to cut a bevel in mat board. 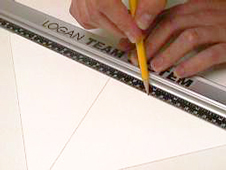 There are several of the Logan range of mat cutters available from our online shop. In this example the cutter used is the Logan 2000 or Logan 302. Cutting the window in the mat is simple when you use the right tools. 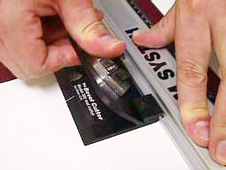 Professionals use straight line mat cutters and lately an abundance of computer controller mat cutting machines have become available. Here I am using the Logan 2000 coupled with a Logan ruler that allows the cutter to be “locked on” to the rail.The rail is positioned on the line you wish to cut with it placed on the outside of the window.Remember to place a piece of scrap mat under the one you are cutting. The start point is when the line on the back of the cutter is lined up with the window opening. 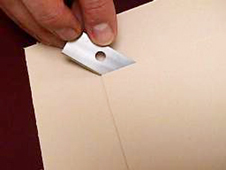 Plunge the blade firmly into the board by pushing or pivoting the cutting head. Push the cutter along the line…or pull it if it is a Logan 3000 or 4000. It is important to make sure that you hold the ruler firmly. 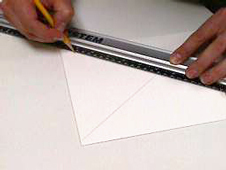 I usually creep my hand along the ruler as I go…just like crawling. Push the cutter a bit then move your other hand so that you are always just ahead of the cutter. You need to keep pushing the cutter until the guage on the back of the machine reaches the stop point. After you have cut each side, carefully turn the board over. 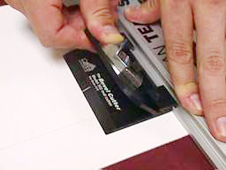 If you haven’t cut each side perfectly…don’t panic!It is vital that at this stage you treat the board and window dropout with kid gloves.Any areas that are undercut you can trim with a spare mat cutting blade.Be gentle and remember that you are only cutting the top surface paper. Look where you are going and cut cleanly on the right angle to the corner. Mats are usually judged on how clean the corners are so make sure you don’t overcut the corners. 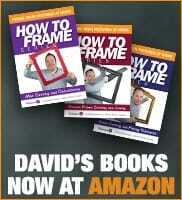 Lift out the “dropout” and try the mat on your picture.